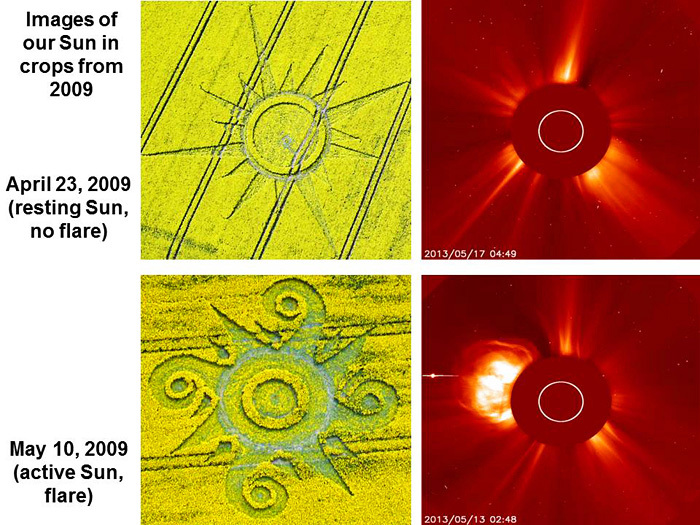 In the following (linked) article, Dr. Horace Drew (AKA “Red Collie”), explains to us his insightful thoughts regarding apparent predictions that some Crop Circles make regarding events which transpire in our solar system, and on our planet’s surface, months to sometimes years before these referenced events actually transpire. This is a very thought-provoking article, and I have to congratulate Collie for the time and deep thought he gives toward his analysis of the Crop Circles. One wonders whether Collie’s observations imply that the Visitors have the ability to time-travel, or whether the Visitors are rather like highly skilled “meteorologists”, able to predict future events in our solar system based on extrapolation from current observations combined with knowledge of historical norms. Either way, it appears that our Visitors are, by some means, able to accurately relate to us the nature of future events through their Crop Circle designs, and this apparent ability is nothing less than astounding! Red Collie’s article is posted in its entirety at www.cropcircleconnector.com, and HERE is the link. Remember, don’t ever approach the Crop Circles without first putting on your thinking cap!